This module clocks in at 26 pages, 1 page front cover, 1 page editorial/ToC, 1 page SRD, 1 page back cover, 1 page inside back cover (which doubles as a picture you can color), 1/2 a page advertisement, leaving 20 1/2 pages of content, so let’s take a look! This review was moved forward on my reviewing queue as a prioritized review at the behest of my patreons. First of all, before I go into details: This module is intended for a younger audience – basically, this is intended to be a very kid-friendly module – to be more precise, for the age-range of about ~ 6 years. I ran the module in my playtest with a mixed group spanning the ages of 4 – 11 and the players that had most fun were those in the lower ages, so personally, I’d suggest this approximately for ages 4 – 8. The module does take into account the changed requirements of the target demographic – namely by calling out when a good time for a break would be, when to guide them by incorporating suggestions into your “What do you do?”-questions, when to explain the discrepancy between character and player-knowledge…the like. For parents not sure whether their kids can handle “killing” adversaries, an alternate wording is provided as well, with the defeated “returning home.” The copious amounts of advice provided are generally not only welcome, they tend to be very sound. I, for example, wholeheartedly endorse the notion of taking away nonlethal damage penalties in combat encounters and rewarding PCs for doing “what’s right” and handing off defeated foes to the proper authorities. It is my experience that kids become pretty adamant about doing “what’s right,” particularly when bonus XP are on the line – this may sound stupid to adult readers, but it is my firm conviction that acting like this can help kids develop their moral compass. Even distribution of candy/gummibears used as monster-substitutes on the map also is a pretty sound advice, since it prevents instances of jealousy and kill steals, while still providing immediate gratification. The monastery of the monks of the kneeling wind is a tribute to the elements and, visually inspired by Japanese aesthetics, well-represented by a truly beautiful full-color map. Alas, all things must end, and so did the time of the monks – and after they were gone, the crystal dragon Azhuryx chose this place to rear her precious wyrmling Kurisutaru. Alas, once again, trouble brewed and the mother dragon did not return from a hunt, leaving Kurisutaru terribly bored with the soulbound doll left for him, yet cautious of strangers. One day, Kurisutaru saw a child folding origami and was left overjoyed when he saw dragons among the figures crafted – he thus swooped down to talk with the magical prodigy Azumi, who, in a panic, conjured forth an origami crane (made possible via the new spell) and sent it forth – said crane is what jumpstarts the module in earnest, as the PCs happen to find the origami swan and read the cry for help on it. In order to reach the monastery, the PCs have to start climbing the mountain (a great way to btw. use the hazard here to explain altitude sickness as they encounter it to the kids for a nice educational interlude) and on site, the exploration can commence – the PCs can for example brave the most huggable earth elemental I can imagine. A Wisteria tree whispers to the PCs that the key to Azumi’s location is hidden in the koi pond and indeed, swimming in can yield it. Underwater, the PCs encounter a friendly, awakened koi who breathes bubbles on them and wants to talk to them: He’ll give them the key, if they answer a simple riddle. Beyond the moon-viewing tower, there are animated dog statuettes that may attack (impotently) the PCs – less defense and more offense would have probably made this encounter slightly more enjoyable, but that may just be me. The PCs will also have a chance to test their mettle against the haunt-summoned non-evil undead weapon master of the monks in honorable combat. In the just as lavishly-rendered map of the complex beneath the monastery, a Sudoku-puzzle beckons alongside a friendly haunt testing the PCs whether they can distinguish reality from illusion, while another requires balancing on a rope to swing a bell…in an interesting twist, the spectral teachers of the monks may provide guidance in-game to stumped players. Combat-challenges include dealing with the dragon’s overprotective soulbound doll and some animated objects. When the PCs finally happen upon the dragon, they’ll think they have a deadly fight on their hands…but Azumi intervenes and the PCs have a chance to make friends with the dragon, the positive modifiers of which btw. also entail playing a game of hide and seek with the dragon…and hopefully convey to him that kidnapping others, no matter how well-intentioned, is not a good way to make friends. In the end, though, capable PCs will probably leave on Azumi’s origami riding cranes, with Kurisutaru’s friendship bracelet for a fine, tasty dinner at Azumi’s house – who now has a friend most unique. Editing and formatting are top-notch, I noticed no significant glitches. Layout adheres to a Japanese-looking, beautiful 2-column full-color standard and the pdf comes fully bookmarked for your convenience. The book provides ample of child-friendly artwork from the pen by Jacob Blackmon -more so than in many modules of this size, rendering it a nice, visual treat. The unified and beautiful style also extends to the gorgeous cartography by Travis Hanson, which also features player-friendly versions that you can print out, cut up and hand out to them as they go! Extra kudos for that update! Jenny Jarzabski and BJ Hensley have already proven that they can make good crunch; however, as it turns out, they can also write captivating modules. “A Friend in Need” is a great first module for the small ones, breathing a bit of the spirit of Hayao Miyazaki’s movies and the innocence conveyed therein. It is not perfect, being a freshman offering, with minor hiccups like the somewhat tedious combat versus hardness 8 animated dog statues…but it is still a pretty impressive one. You see, the module does a lot things right: The flavor is child-friendly. Even the spirits of the monks, which may evoke a slight sense of creepiness (in a good way), still provide more aid than hindrance. The challenges are diverse and the inclusion of social encounters, riddles and puzzles make sure that the players actually are challenged in more than one way, which is a good thing in any module, particularly so in one intended for kids. Now personally, I do believe that even small kids can handle a bit more threat and danger than this module featured (see e.g. the pretty serious themes of fear of loss and reorientation in “My Neighbor Totoro”, for comparison), but I will not hold that against the pdf. It should be noted that I ran this with a 4-year-old among the players and the module proved fitting for children this young as well, while the kids in the age-range of 8 and beyond would have liked a bit more grit. Now the good thing here is that, should you not endeavor to cater to a crowd as diverse as I did in my playtest, you’ll have no issue slightly increasing the creepy-factor of the benevolent monk-spirits – in my playtest, I added some minor creepy-dressing to them and thus managed to engage the kids even more – if you heed this advice, though, please make sure you know what your players are comfortable with – a tiny scare is okay, but not more. How to rate this, then? Now that’s the tricky part: You see, I very much believe that we need more modules like this. In fact, many more modules. I have vastly benefited from my roleplaying in both terms of foreign languages, vocabulary, problem-solving and social skills and the sooner we can get such a positive development going, the better. At the same time, I am somewhat hesitant of awarding this per se very good module my highest accolades – it is my firm belief that a slightly more pronounced emphasis on morality (or a slightly more complex hide-and-seek-encounter) could have added that little je-ne-sais-quoi to this already very good module. Ultimately, we are left with one well-crafted module for young children – hopefully, only the first of many more to come. My final verdict will clock in at 4.5 stars for this freshman offering, rounded up to 5 for the purpose of this platform. Congratulations to the authors for an impressive first sojourn that certainly made the children ask for more. 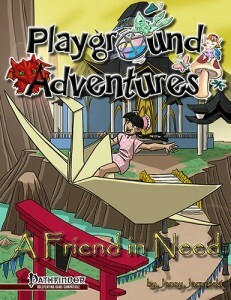 You can get this kid-friendly module here on OBS and here on d20pfsrd.com’s shop!